Thank you so much for your patronage! 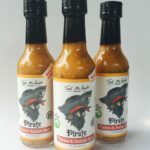 Be sure to sign up for our enewsletter (bottom right of our homepage) to be notified of our online shops opening, learn new recipes and find out about new sauces that Tad McBride Sauces is cooking up! Through painstaking experimentation for over 10 years, Tad McBride has crafted and refined Samurai, an all-natural vegan sauce. 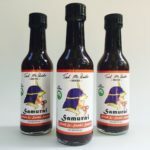 Utilizing a soy sauce base, Samurai Sauce is infused with garlic, red wine vinegar and other spices to serve your taste buds with a bold blend of salty and sweet. Check out these stores where you can purchase our sauces or contact us directly to order your own stash!